The last thing you want to happen during your workday is for your printer, copier, scanner, or fax machine to break down and bring your current projects to a complete stop. That’s why we are here to help. 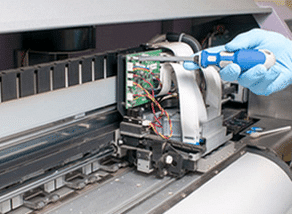 We employ technicians familiar with the most popular brands of printers, copiers, fax machines so they can get your equipment back up and going again. We service on both a national and local basis to provide you a solution for repair services that works for you and when you need it. Our software is technologically advanced and follows the repair process from the moment you submit your trouble ticket until the issue is completely resolved. It ensures that your problem doesn’t get accidentally pushed aside or forgotten about. We also keep track of the problem, what we’ve tried to do, and when the issue is fixed and no longer needs our services for that specific ticket. Our goal is to be the complete solutions partner for our customers. We also believe in keeping our customers updated on the status of their ticket. We let you know when we’re working on it and update you when we send a technician to the job site. You aren’t left in limbo wondering when or if your printer, copier, or scanner is going to be fixed. We include an estimated time of arrival and travel with well-stocked vehicles to ensure we’re able to fix your problem the first time we come out without needing to return at a later time with the correct parts. We are an authorized retailer of most major brands of printers, scanners, copiers, and fax machines including HP, Xerox, Lexmark, KIP, Brother, and Copystar/Kyocera. Our extensive knowledge of these machines makes us able to fix your problem without complications or hold-ups that damage your productivity. Our number one focus and goal is to provide service to get your equipment back in operational shape as soon as possible, and ideally, at our first and only visit. We pride ourselves on having excellent customer service skills. Don’t wait any longer.